The License button will change to “License UPDATE“. Clicking the button opens the License wizard, where each of the products are listed with the version installed and the new version available (if any). 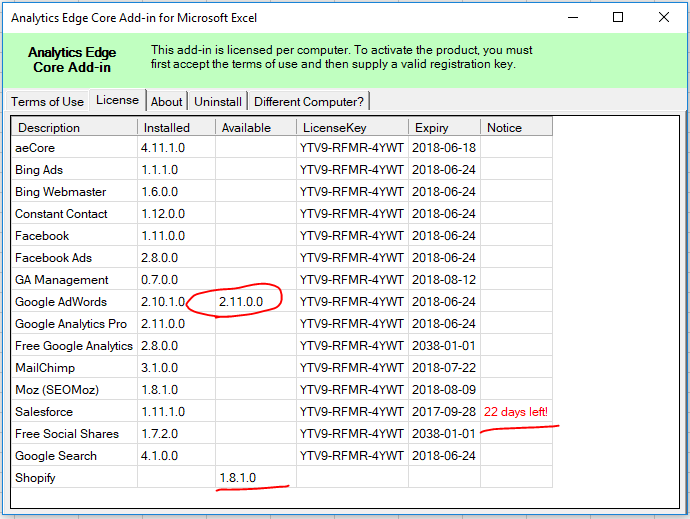 You will also see if any product licenses are nearing their expiry date. You can also see what other connectors may be available. To install any update, simply click on the entry (e.g. Google AdWords), then click the Install button! Updating connectors requires restarting Excel to load the latest release; updating the add-in itself is as simple as downloading and running the new installer. I try hard to maintain forward compatibility. Your saved accounts and configurations are safe, but note that sometimes the API that a connector uses may change, and some metrics or reports may no longer be available. If this happens, you can Uninstall the latest connector update, but the old connector may stop working if the service turns off the old API [Facebook Ads and Google AdWords in particular].